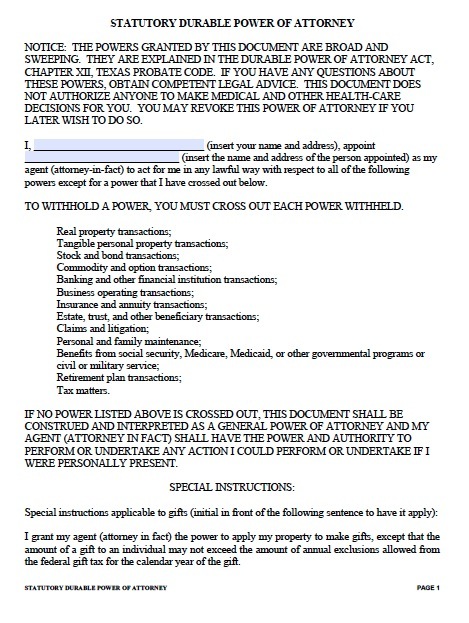 A power of attorney for finances can be a very useful tool. You can authorize someone to manage almost any financial or property matter of yours. The form is flexible―you can grant unlimited financial powers, or only a small number by placing your initials in front of each power you wish to grant. If you only need to authorize someone to use your bank account to pay your bills for a set amount of time, you can simply authorize banking transactions and nothing else. The new statutory form in Texas features a lengthy notice at the top to inform readers that the document grants sweeping powers. It also directs the reader to the Durable Power of Attorney Act, which explains these powers, and has a notice at the end stating that the agent assumes fiduciary and other legal duties by accepting the appointment. This means the agent has a legal obligation to act in the principal’s best interests.